At the start of the new millennium, development actors established a global consensus and adopted the UN Millennium Declaration. The eight Millennium Development Goals (MDGs) that were formulated expressed a commitment to meet specific targets by 2015. Thus, for the first time in history, the fight against poverty was put forward as a global objective, a shared interest of all involved. Achieving the MDGs became what development was all about. 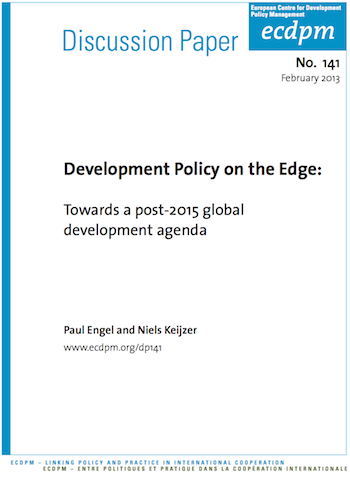 Little more than a decade later, however, the global development policy landscape has fundamentally changed. The development sector is being pushed into a corner, not only by those who in the past criticised it as a rather ineffective, self-perpetuating ‘industry’ but now also by those pointing to the need for a complete overhaul in light of new global challenges. Development, it could be said, found itself between ‘a rock and a hard place’ (Engel 2012: 5–7).